Lead by the outstanding fast bowling trio of Kagiso Rabada (1/16), Duanne Olivier (2/32) and Man of the Match Beuran Hendricks (2/21), the visitors stunned the home batting line-up by restricting them to a sub-par 113/7 on a sluggish pitch in Cape Town. Dan Christian (1/11) and Simon Harmer (0/14) also excelled, before Rassie van der Dussen – the leading batsman in the competition – struck an unbeaten 55 (54 balls, 8 fours, 1 six) to fittingly lead his side to victory in the inaugural MSL T20 season with 15 deliveries to spare. For the Blitz, the outstanding team during the league-phase of the season after winning six out of 10 games, it was a disappointing end to a campaign that promised so much. 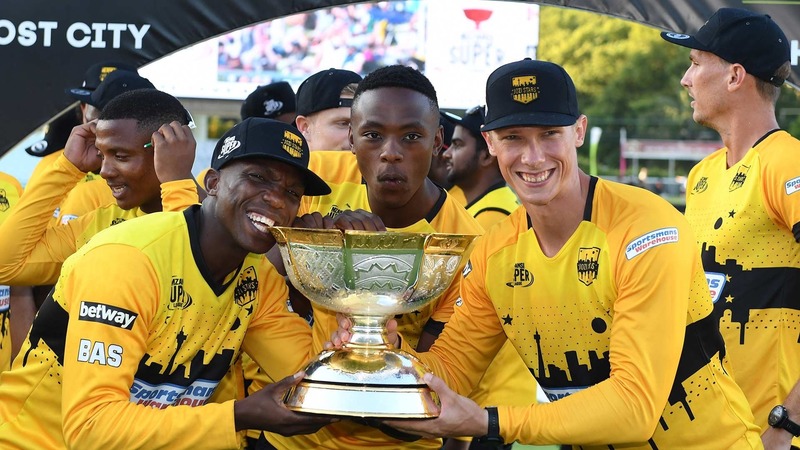 They had won the toss and opted to bat first in the final, but their batsmen bottled it in front of a sizeable home crowd of nearly 12 000 in the Mother City. They were rocked in the second over when the in-form Quinton de Kock was dismissed through an excellent catch running back by Reeza Hendricks off Beuran Hendricks for five. Fellow opener Dawid Malan managed 17, before he too succumbed inside the powerplay overs – chipping Olivier straight to Nono Pongolo at mid-off. Pakistani duo Mohammad Nawaz (3) and Asif Ali (4) followed in quick succession leaving the Blitz in a big hole at 48 for in the 10th over. Kyle Verreynne jointly top-scored with 23 before he went. The wickets of Andile Phehlukwayo (4) and the captain Farhaan Behardien (23) left the hosts staring down the barrel. They were bolstered towards the death with Ferisco Adams (12) and Dale Steyn (15), at least helping them cross the three-figure mark and giving them a target of 114 to defend. But that total proved absolutely no match for the Stars and their star batsman Van der Dussen. For the Blitz to have any chance, they needed a good start and got it too when Ryan Rickelton was cleaned up superbly for six by Dale Steyn (1/20). But Reeza Hendricks (33) helped Van der Dussen add 86 for the second wicket to knock the stuffing out of the Cape side, with Dane Vilas (4) then accompanying his main man over the line. Van der Dussen and Olivier added to the Stars triumph by being named leading batsman and bowler of the tournament respectively. Gihahn Cloete of the Tshwane Spartans was named the best fielder while the MVP award went to the Blitz’s Quinton de Kock.